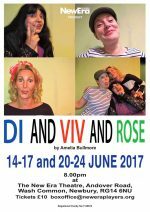 Amelia Bullmore’s Di and Viv and Rose is an endearing and heart-warming play. It follows the lives of three young women who attend university together in 1983 and move from their first year in ‘halls’ to sharing a house and forming a strong bond between them. They are an unlikely trio, whose friendship lasts through the next 25 years. Studying art history, Rose (convincingly played by Georgie Gale), is an intriguing vivacious and promiscuous character, who has a quest to sleep with any boy she fancies and does so with alacrity especially with Conrad. However, such permissiveness leads to inevitable consequences. By contrast, Lisa Harrington’s Viv is a studious sociologist student with a strong work ethic, who finds Rose’s promiscuity difficult to accept. She gives a splendid performance, particularly when she finds her newfound freedom in New York. Her many swift costume changes are impressive. Nicola Johnson brings much humour to role of Di, the willing Northerner, who acts as an eager mediator between the two, forever trying to keep the peace, while exploring her newfound homosexuality. When Rose’s stepfather buys her a house, there is great excitement and joie-de-vivre as the girls set up their first home. Cue the song Our House. Thank goodness Rose can cook, while Viv is the practical one, sorting out the phone and Di is an all-round jolly good sport. Many of the audience who may have gone to university will empathise with the joys and sadness of student life as the girls share their hopes and future plans. As Di becomes more at ease with being a lesbian, she begins to date, but a devastating incident leaves her scarred and depressed. Meanwhile, Viv continues her studies, writing essays on comparing women’s corsets to men enslaving them. Three years pass quickly and each goes their separate way, but they promise to keep in contact. Rose produces twins, Viv moves to New York for an academic career and poor Di returns home to live with her parents – “I’ve gone back to fish on Fridays and not being a lesbian,” she glumly tells us. They do meet up in later years, but although times and circumstances have tragically changed there is an underlying faith and believe in true friendship that shines through. 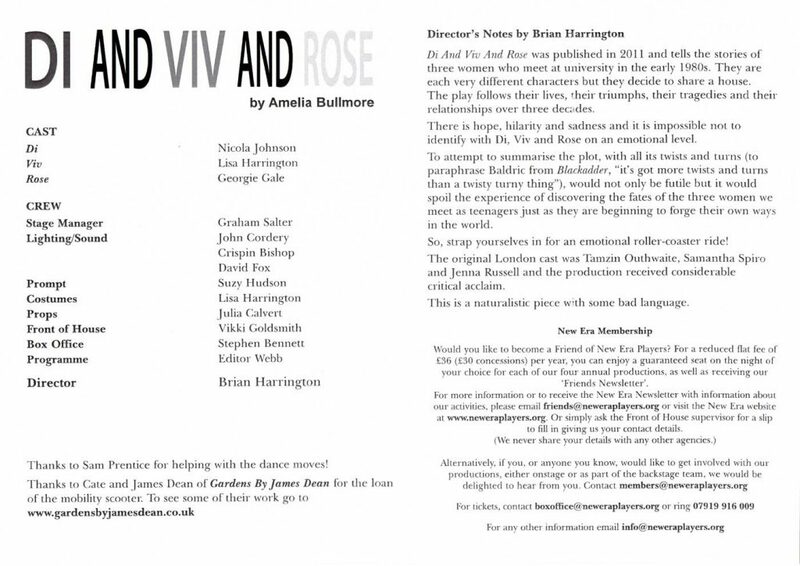 Perceptively directed by Brian Harrington this is a touching and moving production. 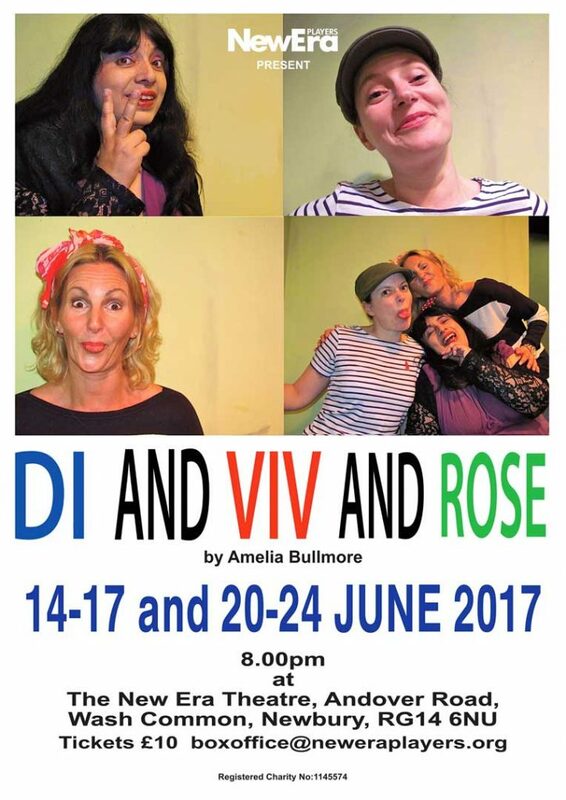 “Di and Viv and Rose” was written in 2011 by Amelia Bullmore and tells the story of three women who meet at University in 1983.They are very different characters but form lasting friendships. We follow their interactions and their lives over the next 30 years in a series of scenes which highlight their highs and lows, their triumphs and tragedies and explores the impact of their friendship on their lives and of their lives on their friendship. 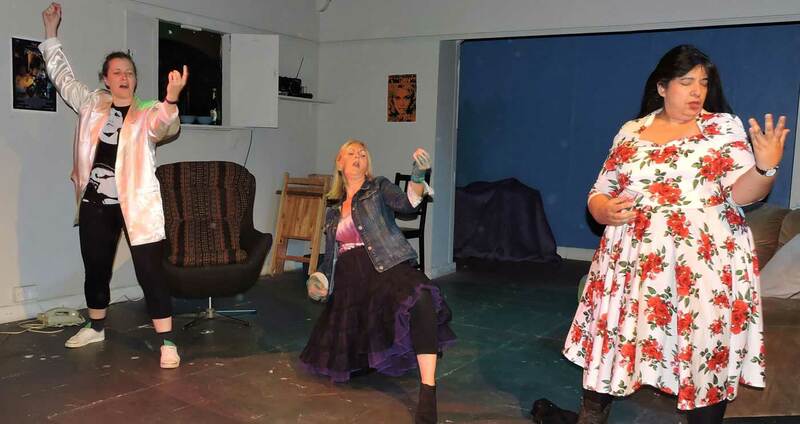 The play runs the full gamut of emotions with moments of sheer comedy as well as pathos.